New York: Putnam, 1981. First edition. Paperback. A very good plus solid, clean copy. Uncorrected Proof, in the original orange perfect bound printed wrappers (text only, no image). Spine free of type, 354pp. This novel introduced the world to Dr. Hannibal Lector, and was adapted for the film "Manhunter." 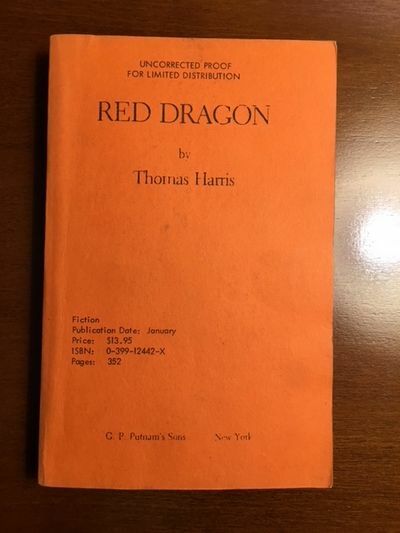 Thomas Harris wrote a sequel to the novel, Silence of the Lambs, and, the rest, is history. Lecter was based on an actual doctor in Mexico, a surgeon by the name of Alfredo Ballí Treviño, who was convicted of murdering then chopping up his gay lover.